The Boys’ High School And College,originally established in 1861 is one of the oldest educational institutions of Allahabad. It is located on a lush green campus of 13-acre in the heart of the city, in Civil Lines, at 4 P.D. Tandon Road. Since its inception, the school has been a trail-blazer in the field of education and was one of the first institutions in the city to start co-education. However, with the passage of time, the co-educational character of the school was lost and teaching was confined to boys only. In its glorious history of 151 years, the school has undergone several types of changes, in terms of location, (physical and academic), volume and status. Changes invariably bring challenges and problems, but the school was sufficiently resilient and buoyant and endowed with experience and maturity to weather them. It is a matter of great pride that even today, Boys’ High School & College is a pioneering institution in the domain of higher secondary education in the country. The government records and documents, available with the Archives Department, reveal that the Boys High School was started in 1822 near the present Curzon Bridge to cater to the need of the children of the European servants of the East India Company. Later, the school was shifted to the Allahabad Fort area. The present site on which the school exists today was acquired in 1860 from the area that was known as Bundwa Village. The school was founded on the fifth day of November in the year 1861,and also became a government recognized institution. 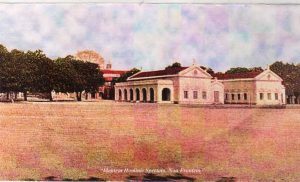 The grounds were leased to the Allahabad High School Society which was running this institution free of ground rent so long as the Society planned to run an educational institution on the site. The present boarding house, main school office and the school block were ready in 1864.However, before that, the classes were held into long-thatched hammock-like buildings, one for the boys and another for the girls, for at that time the school was co-educational .Greek Latin and French were regular features of the curriculum, besides subjects, like Mensuration, Arithmetic, Grammar, etc. The school was founded and run by the Englishmen and women who were ‘keen to advance the cause of education in Allahabad’ according to the doctrines of the Church of England, especially among the children of the European and Anglo-Indian descent. That, from its very inception, the founders envisaged the admission of all the communities is proved by the fact that the Articles of Association provided a conscience clause for all those who, for any reason, preferred that their children not be educated in the doctrines of the Church of England. The school was given liberal grants by the government at that time for increasing its physical infrastructure. The grants were utilised for the construction of the school, the boarding house building, the principal’s bungalow and the building for the staff members behind the existing school hostel. The two staff bungalows, situated across the field, were purchased by the Police Department for Rs.14,600 in 1916. The government again gave a special grant for this purpose. The school was affiliated from 1898 to 1914 to the University of Allahabad, which was at that time also known as the Oxford Of the East. Later on up to 1929 it was affiliated to the UP Intermediate Board. The Cambridge Overseas School Certificate Examination was started in 1915. Science classes were started in 1917 by the school at the request of the government which, besides giving liberal grants for the building and equipment, agreed to pay the salary of the science teacher. The Diocese of Lucknow closed down the Colvin Free School situated on the city side of the Allahabad Railway Station in 1936 and amalgamated it with this school. The idea behind it was the growing deficit in the finances of both the schools. To meet the ever-growing demand, a manual training shed was built in 1940, a new hall in 1953, and a cycle shed in 1957. The financial position of the school was very precarious till about 1945. The school tried its very best to heavily reduce its deficits, and appeals to the government for financial aid were also readily looked into. But in 1907, the records show, the government proposed degrading the status of the school to that of a middle school if the management failed to cut the growing deficit. In the year 1899, the school authorities sold the boarding house and the connected building to the government for Rs.12,000 in order to clear the deficit and agreed to pay Rs.90 per month as rent. Even this meagre amount often went into arrears. In 1940, the Allahabad High School Society purchased all the buildings on the campus back from the government and became the sole owner of the property and has been running the school since then.